OK. 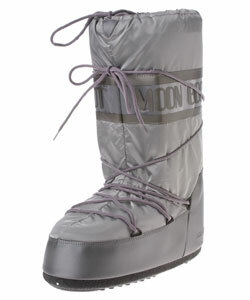 Fashion question of the day: Moon boots? And the product description for these boots includes this warning: "This footwear not designed for space travel." I kid you not. Of course, I would not want to wear these ugly things anywhere else besides the moon where it's just me and Burt Rutan hangin' out. Anyway ... Overstock.com has 'em for the bargain price of $56.99 (original price: $149.99). Get 'em while there, uhm, hot. I never thought I would see these again. Moonboots. Jesus Christ. Stop the madness before the 80's return. Parachute pants. Leg warmers. Big poofy hair. It may already be too late.